Coconuts for Easy Veggie Coconut Curry! A few weeks ago, after returning from an amazing tropical vacation in Belize with the Hubby and Fam, I decided to whip up this tropical dish to help keep that vacation high alive! I love all types of ethnic foods and different spices. However, please note, because some people get confused: Just because something has spices, that does NOT mean it is spicy! This dish is loaded with healthy veggies and best of all, you can really make this dish your own by adding or subtracting the veggies that you like. I loaded up this dish with tons of veggies, and because of that, I happened to have leftovers for days! So definitely note that this makes A LOT OF FOOD. I adapted this dish from an AMAZING food blog called, The Minimalist Baker. Her dish looked so delicious, but I wanted to add noddles and more vegetables. But do check out her recipe if you want something more minimalist…hehe. Now, the serving size is normally for 4, but because I added so many veggies and noodles, I would say this could easily serve 6 people. 1. Heat a very large pot, saucepan, or wok over medium heat with 1 Tbsp coconut or olive oil. Add the onion, garlic, ginger, carrot, broccoli, cabbage, and red pepper. Cook, stirring often until softened 10-15 minutes. Add the bamboo shoots and cook for another 5 minutes. 2. Add in the curry powder, cayenne powder, veggie stock, coconut milk and some salt and pepper. Bring to a simmer and then reduce the heat a bit and continue cooking for 10-15 minutes. Taste and season more if needed! 3. While the curry is cooking, follow the directions on the back of package to cook the rice vermicelli noodles. (Most say to cover with hot water and let stand for 10-15 min). a. 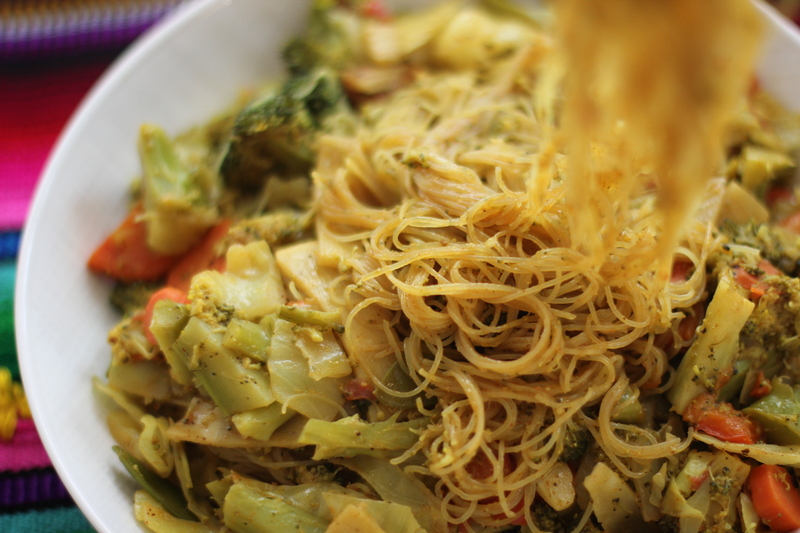 Serve the curry over the vermicelli noodles. b. 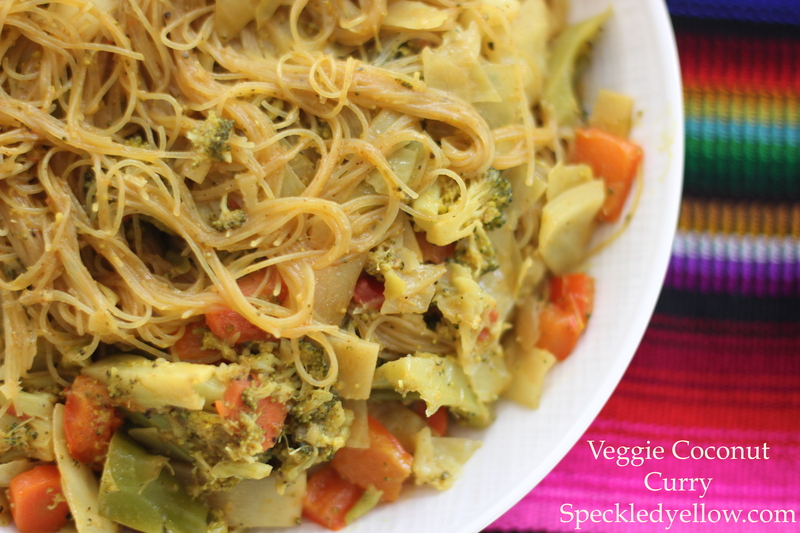 Mix the vermicelli noodles into the curry so they really take on all the spices and curry flavor! This is my favorite option. 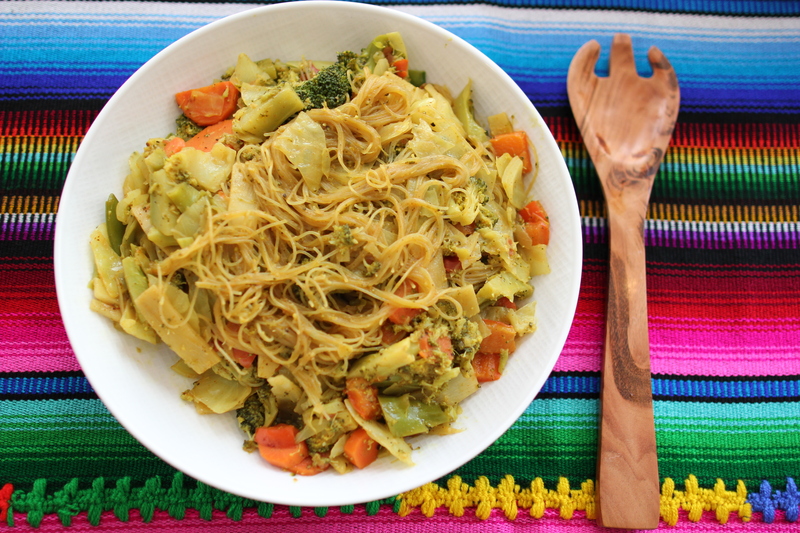 I recommend mixing the noodles in with the curry and letting them sit and soak up all the flavors for a few moments before serving!